My first visit to Wansdyke went by almost completely unnoticed. 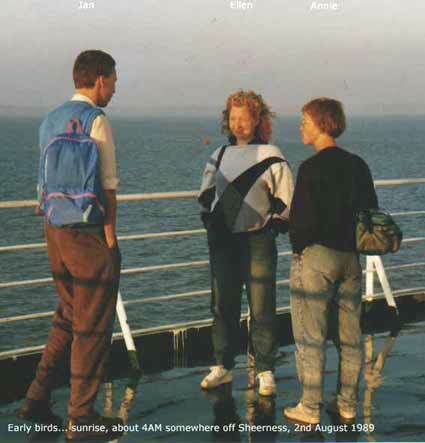 I was on my first cycling holiday in Britain, together with my friends Annie, Ellen and Jan (click here to see them better), who had never done such a trip before as well. 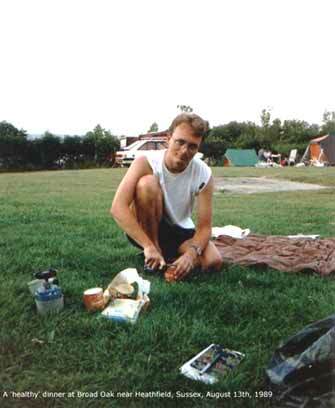 True enough, we had been practising in the Netherlands to test the equipment, but the British countryside was a bit of a novelty to all of us. Me being the historian with scarce local knowledge, I should have noticed the thing in the first place.. And in fact, I had read about it earlier. Wansdyke figured in two books I had devoured as a young adult reader; The Lantern Bearers and Dawn Wind, both by Rosemary Sutcliff which I had read many years before (translated, of course). But that memory returned only much later. 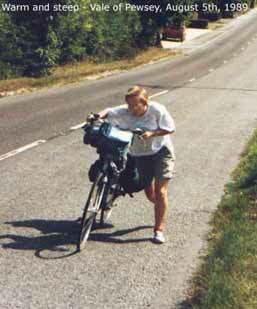 At that time, we cycled on Michelin maps (for cars) and we couldn't tell a megalith from a molehill! We simply got on our bikes and saw the countryside as it rolled along in front of us. Though I think we all read 'Watership Down' by Richard Adams, so we noticed the Rabbits' adventurous world when passing through Berkshire on our way from Basingstoke to Marlborough. We had travelled by train from Sheerness to London (braving the traffic there to switch stations!) and on to Basingstoke. After a night near Andover we reached Marlborough and stayed there for a day at the very nice Savernake Camp Site (top right), which is in the forest. 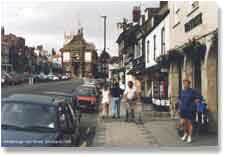 We visited the town, which is not very large and has a very characteristic (may I use the word) High Street, with very good shops and pubs (click here to enlarge the image) as well as some very beautiful spots in the area, such as Sanctuary Stone Circle. 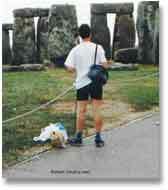 This megalithic monument is still a fine place to visit, even though all stones have vanished. It stood at the starting-point of the eastern Avenue of standing stones that still lead up to Avebury. It is a beauty-spot nonetheless (click here for enlargement). The stone slab with information has since been removed, though I have no clue wether by criminal elements or the proper authorities - when I returned here in 1992, there was a plastic replacement. I have included a picture of it to make up for its loss (click here for enlargement). However, we completely missed Avebury. Well, at least I saw Sillbury Hill (brilliant! 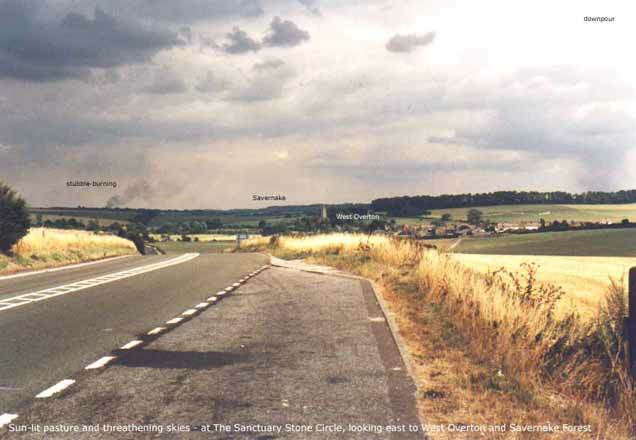 ), but we had no clue of Avebury, which lies just a few miles away. Silly, wasn't it? 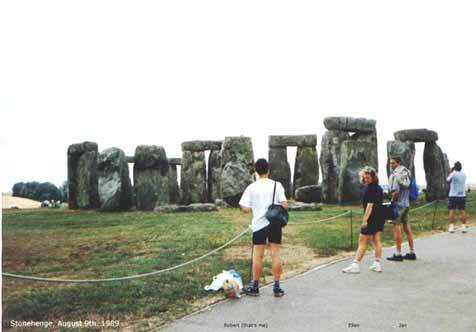 But then, our goal was Glastonbury in Somerset and we didn't know about megaliths at all at that time. And Wansdyke? Just a blot on the map - I still marvel about the total lack of local interest in this monument. No signs, no books, no mention in the local guides or leaflets. 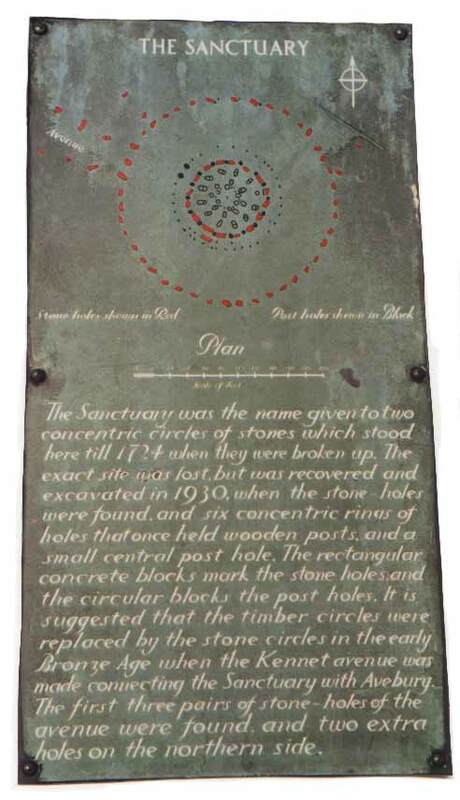 I absolutely think that the local folk, spoilt as they are with Stonehenge, Avebury, Silbury Hill, quite a few White Horses and some Roman villas, have no clue whatsoever about this piece of their history. Too bad. So, no small wonder that we failed to find Wansdyke. That's why there's only a picture of the skyline here, taken across the Vale of Pewsey in the blistering heat of a very fine August morning. That morning we broke camp to resume the trek. 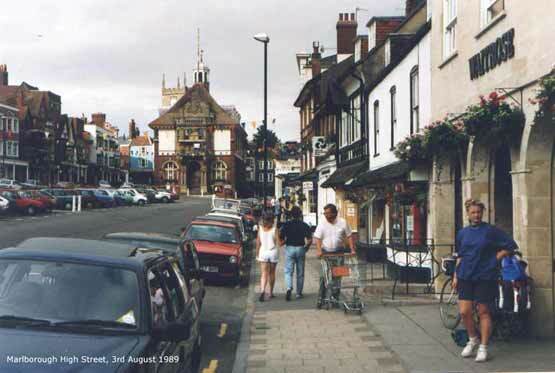 We had set out on our way to Glastonbury, and after passing through Marlborough, we took the first main road south to Pewsey. 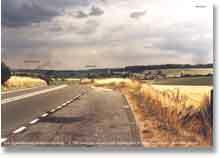 This road (the A 345), after climbing the escarpement near Marlborough, happens to go down the Avon valley. 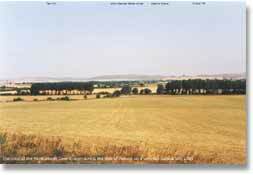 We passed by Wansdyke completely unnoticed during the climb along the A345 from Marlborough towards the Vale of Pewsey. Only later I looked back to take this picture, when the road got so steep we had to wait for.. (click here to see who!) 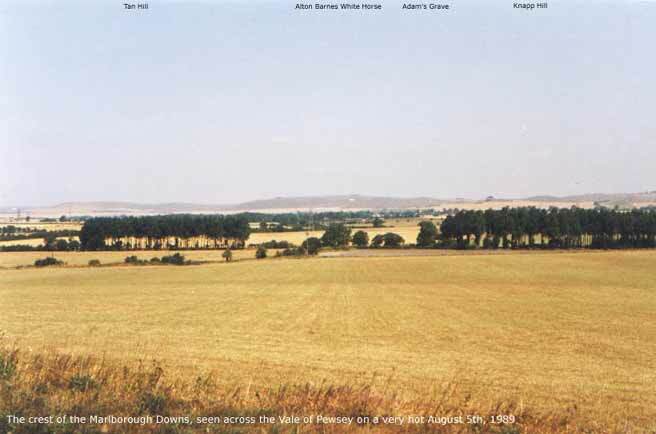 To tell you the truth, this was not because of Wansdyke, but mainly because of the Alton Barnes White Horse, a figure cut out in the chalk of the hills which you might just make out in the centre. Wansdyke runs along the crest of these hills, or the Marlborough Downs as they're called (click here to see more of them). Our holiday went by in continued good spirits, and though we missed out on Glastonbury... Goodness me, we were a sorry bunch! Yup, that's me in the picture left (click here to see the look on my face - my gosh! I still had my hair by then!) We took a wrong turn outside of Wells that same evening, ending up miles off to the north on the first camping area we stumbled across after dark... The Mendips were good enough to make up for that, especially Cheddar Gorge. We continued our round trip back through Shaftesbury, Salisbury (we DID see Stonehenge!-click here to see we did), Winchester, Hastings (both the battlefield and the beach) and Canterbury in the finest of weather. The British countryside is of such beauty, I am hooked to it ever since this first holiday. It's not just the land, it's also the people and the history - every hedge has it's own set of legends, which I don't think is too much an exaggeration! But there would be another opportunity in three years time. 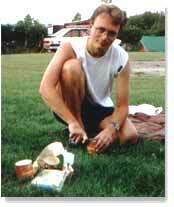 VortigernStudies and Wansdyke Project 21 are copyright � Robert Vermaat 1999-2007.